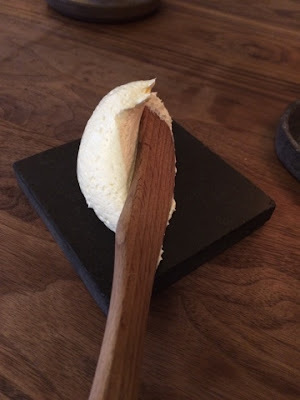 Last time I posted I had decided I'd group my Norway food stories together by city. But I'm going to prove myself a liar here. The first dinner we had in Norway was definitely the prettiest meal of the trip, and one of the most interesting and tastiest, too. We went to a place called Arakataka, which the Chowhound crowd liked, and which was an easy walk from the hotel, in addition to not being crazy expensive. The space was beautiful, spare and modern, and the menu was really fun--lots of small plates, so you could assemble your own multicourse menu. We followed their advice and had 2-3 things apiece, plus some Norwegian cheese for dessert. First, bread. Bread in Norway is fantastic! Dark and multigrainy and very tasty. Good bread for long winter nights. 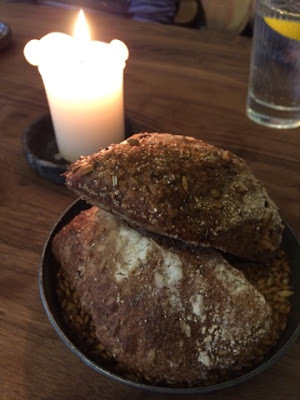 The bread was served on a bed of toasted wheat berries--nice touch! And the butter. Norwegian butter is also really good--but then so is all European butter. This was particularly interesting because it was goat, not cow. New to me but very tasty--in between butter and chevre. I really liked the dollop-with-wooden-spreader presentation. 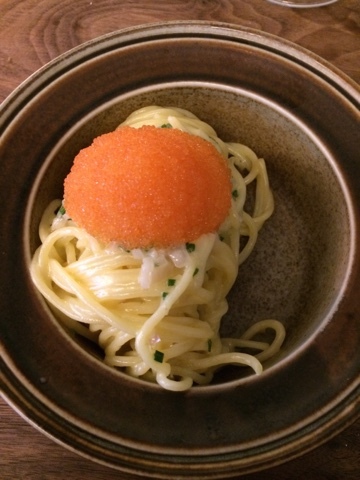 For my starter I got the spaghetti with bleak roe, which was creamy and briny and wonderful. 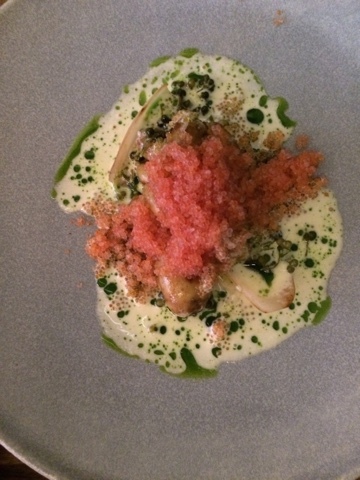 Mom opted for the potato with lumpfish roe and ramson (which is a wild onion relative). It was like a super-sophisticated take on chips with onion dip. 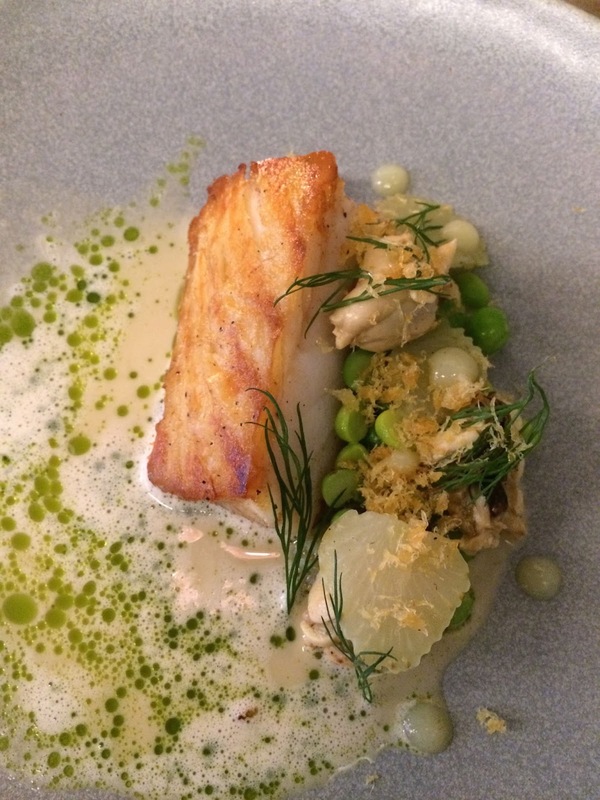 We all got the same second: the cod with peas and mussels. Beautifully cooked, kind of fish & chips-like? 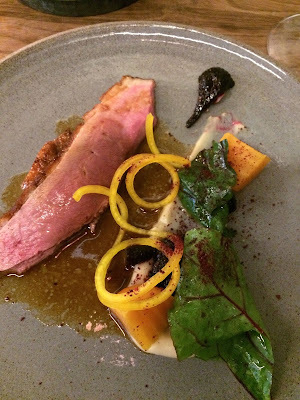 I opted for the duck with beetroot and celery for my main. A tiny piece of duck, but again perfectly executed. 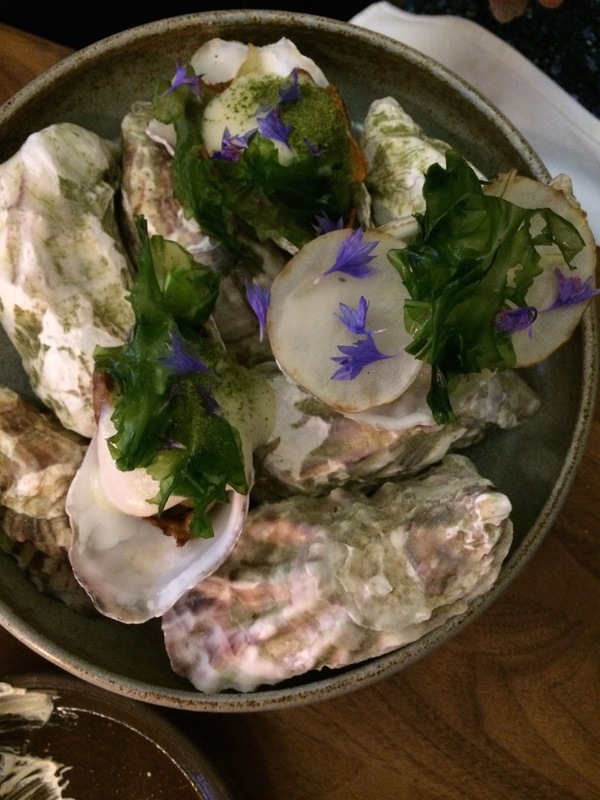 Mom won in the looks department, with the jerusalem artichokes, sea lettuce and oysters. Very pretty presentation--very light (most of the shells are for show, there were only about 3 of them in the dish). My sister J. was undoubtedly the bravest or most radical of us, getting the Peppercrab for her main, which was a lot of work! 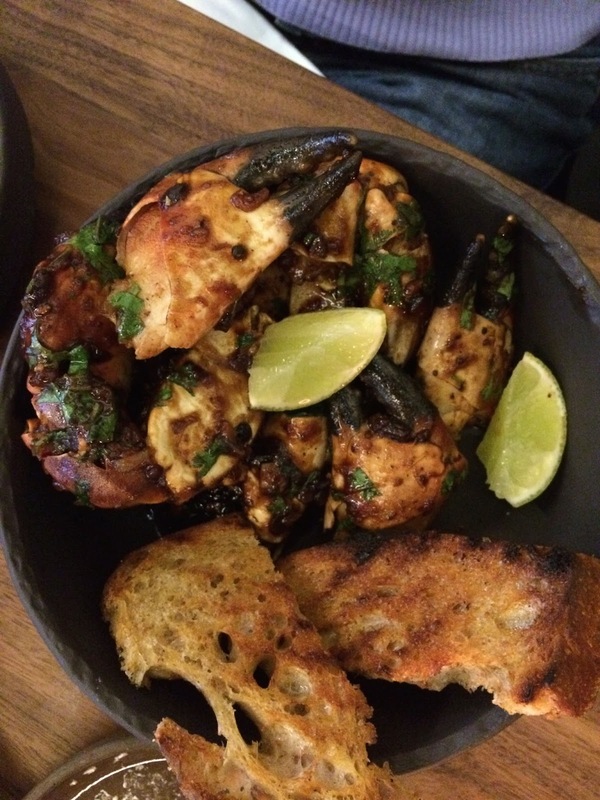 Delicious, not too spicy, but on the messy side for a nice restaurant. I really loved this place--the menu was kind of perfect for the first day--easy to fine-tune to suit just how much you want to eat, and how adventuresome you're feeling. 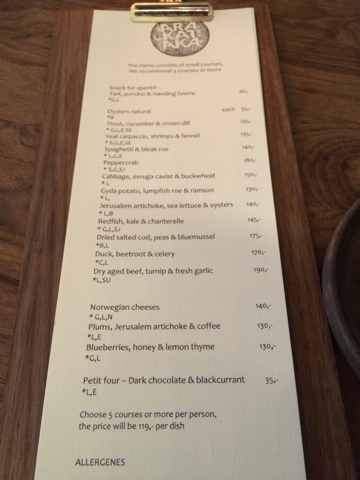 I'd highly recommend it for anyone in Oslo looking for good, seasonal, modern fare from a pretty creative kitchen.